Visiting the salon is a luxury that many women indulge in monthly, biweekly, and even weekly. After working more than 40 hours a week, sometimes you are not in the mood to whip out the conditioning shampoo, deep treatment masque, and curl custard concoction to clean and style your hair. For many, the salon is a serene environment that momentarily takes your mind off of the stresses of the world. But it takes effort to maintain that ambience and a pampering service should be pleasant for all parties involved, including the stylist. Being a hairdresser is a respectable trade just like any other position, but at times clients can forget and even undermine the profession and the workspace. Here are a few things that may be (certainly are) nerve-racking to your hairdressers that you may not have considered. First and foremost, if your salon has a website, they probably have a salon etiquette page. Please advise it, as the owner, stylists, and clients would like to maintain a pleasant experience for all. Yes, you should expect washing to be included in your service, but going 2-3 months without washing your hair is unhygienic. No one goes to the dentist without brushing their teeth and no one gets a full body physical after a workout. Your scalp is a living, sebum-secreting part of your body that needs to be cleaned like the rest of your epidermis. For a beautician to shampoo more than twice can seem excessive, and it requires more of her resources (shampoo) that she may not charge you for to avoid being offensive. And the smell, oh child the smell. Daily scalp massages with castor oil under a 3-month sew-in that has not been regularly maintained can develop an odor. Most licensed cosmetologists recommend weekly washing, so anything past two weeks can be a daunting task to clean for your stylist. All extensions require some kind of maintenance in-between months. To go six months without a salon appointment for two-strand twist extensions could lead to locking (depending on your curl pattern and texture). On top of that, if you are not properly washing your hair with extensions, then the buildup of products, dirt, and lint can create knotting that your hairstylist is left to detangle or cut. Now an extension removal that was scheduled for an hour requires two hours for the same rate? Is that fair? Salons intentionally have a small waiting area as a reminder to not overbook and to build a reputation of being timely. 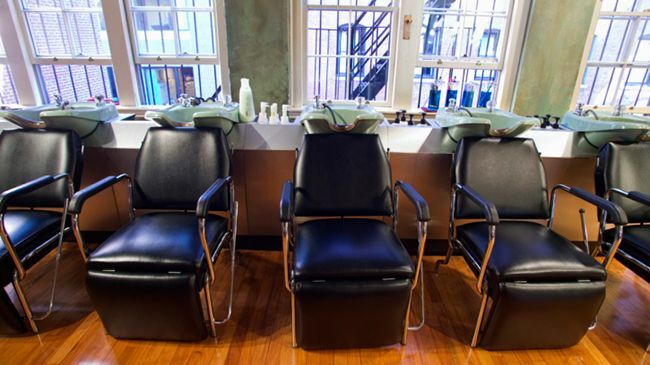 When there are only 2-5 seats designated for clients, it is not in the best interest for the salon to bring people to the appointment who are not being serviced. We all know that washing and styling curly and coily hair requires gentle hands and patience and no one wants their serviced to be rushed, so bringing guests to the appointment while a client stands for 30 min is not ideal. Some clients arrive early, which is never a bad thing. I love babies just like the next woman, but it can be challenging to cut your hair while a child is throwing a tantrum in your lap. I understand that finding a babysitter with short notice can be difficult, but it can be hard for stylists to focus and for other clients to relax with a crying baby. I like to flex my stylist, but hovering over her as she works is uncomfortable. Not only is it an invasion of personal space but time, hard work, and money was invested for them to gain and develop their unique skill set, so having a friend watch and learn is not really fair. I understand that as a parent you want to make sure that everything is going well, but if you have to hover, it may be time to find a new stylist. It is always courteous to cancel 24-72 hours in advance. Like stated before, curly and coily hair require patience and every client is unique, so being a no-show or canceling 15 min before your appointment can be viewed as inconsiderate. I understand that all circumstances are different but how will the stylist’s time be compensated? No one likes cancellation fees so try your hardest to cancel in advance. All salons do not have a waiting list and every client on the waiting list is on standby at all times. Please, just give him or her a quick ring and reschedule. Over the past few years many curls have left the salon for the DIY route, but some still enjoy this pampering service. Please be aware of how we (the clients) can influence everyone's experience and do not forget to tip!